Sometimes the plants just speak to you. Not like we speak to each other, but with different means. You might find yourself attracted to a plant for no known reason, you may notice a plant that you've never noticed before, or you may just think a certain plant is pretty or cute. There's an herb that grows in my yard, and on quite a few trails here in Central Florida. My husband is completely enthralled with this herb. It was the first herb that he learned to identify in the wild, and every time he sees it he gets so excited. It's rather adorable. But for some reason, I had never thought to find out what it's medicinal uses could be. Once I did look it up, I found that it's almost the perfect herb for my husband who grew out of childhood asthma just to have a different set of breathing problems as an adult, and who has a tendency to work himself so hard that he has major muscle cramps. Rabbit Tobacco, Pseudognaphalium obtusifolium, is also known as Sweet Everlasting because of it's sweet smell and the fact that even after the plant is dead, the seed heads remain on the stalk and look like little white flowers, so that it appears to be alive even after it's dead. There is a whole group of herbs that are considered the “everlastings,” and they are used all over the world for various things. From pillow and mattress stuffing to medicine. Here in America, it has mainly been used by the Native American tribes of the South East, and has become a Southern Folk Medicine for a great variety of ailments. But what's with it's other name? There are two explanations for the name “Rabbit Tobacco” from Native American traditions. In one story, rabbit discovered how wonderful this herb was for wounds when it became tangled up in a briar patch. As all native people know, rabbit skin is super thin and easy to tear, even just when running away from a predator. So finding such a useful herb was very good and important for rabbit. This story explains some of the medicinal uses of the plant, and some of it's connection to rabbits, but it does not explain the “tobacco” part of it's common name. However a Native American observation does explain this. Long ago, Native Americans noticed that rabbits would congregate around where these plants tend to grow. So this must mean that it was their connection to the Creator, just like Tobacco is the Native American connection to the Creator. So the plant was deemed Rabbit Tobacco. I found a great video that might help anyone who wants to be able to identify this plant. It may also provide a good introduction to the beautiful world of Rabbit Tobacco. Summary of Actions- Anaphrodisiac, Antiphlogistic, Antispasmodic, Astringent, Diaphoretic, Diuretic, Expectorant, Sedative, Vermifuge. Upper Respiratory- Used internally, as a tea, to treat most chest complaints, especially those involving mucus in the chest. The tea also helps to sooth throat ulcers. You can also burn the leaves, as incense, and waft the smoke into your face. This is done to help treat symptoms of asthma. An alternative to this is to boil some water and add Rabbit Tobacco leaves to the boiling water. Cover your head with a towel and put your head over the boiling water. Breath in the steam to help ease your asthma symptoms or to help clear up congestion. Smoke It!- Aside from burning Rabbit Tobacco as incense, it's also used in several smoking blends, along with other herbs. Most of these help people who are trying to stop smoking cigarettes, but often these blends can also help alleviate symptoms of asthma and clear chest congestion. The smoke is not harmful to the lungs, but if you're worried about the heat of the smoke being too warm, feel free to burn the leaves as incense and waft the smoke into your face. This makes sure the smoke is much cooler when it gets to your lungs. Digestive- A tea made from the leaves is slightly bitter in taste. Anything that tastes bitter is going to help with your digestion. The bitter flavor helps to release bile into your digestive tract. The bile helps to break down hard to digest foods. This helps prevent flatulence, ease stomach aches, and improves nutrient absorption. Rabbit Tobacco, specifically, is also an antispasmodic and diuretic, helping to ease intestinal cramps and improve kidney function. This herb is often called upon when digestive issues involve cramps or spasms. Skin and Wound Care- Native Americans of Virginia have used Rabbit Tobacco as a wound herb for a long time. Muscle Cramps and Twitching- Rabbit Tobacco is great to add to a bath for muscle cramps and spasms. It's also great to use in a sweat lodge or sauna, for the same symptoms as well as fevers. It also makes a great fomentation for sprains and bruises. Sleep Pillows and Sedative Effect- Rabbit Tobacco is a traditional stuffing for mattresses, cushions, and pillows. It works especially well in a sleep pillow because it has a slight sedative effect. Sleeping on a sleep pillow stuffed with Rabbit Tobacco can help ease you into a calm, fulfilling sleep. A sleep pillow made from Rabbit Tobacco is also a traditional remedy for those who suffer from “consumption,” or tuberculosis. Aphrodisiac or Anaphrodisiac?- Some sources list fresh Rabbit Tobacco juice as a mild aphrodisiac, but even more sources list it as an anaphrodisiac, having the opposite effect. However, those sources that consider it an aphrodisiac tend to use it specifically in cases of impotence, so maybe it only works as an aphrodisiac in those cases. Contraindications and Warnings- None known, though several people avoid the use of this herb for various reasons. I only included a basic introduction to this amazing herb. I hope you have learned a new appreciation for how beautiful Rabbit Tobacco is. If you have any questions or comments, please leave them below. The severe flavor discharges bile into your stomach related tract. The bile separates hard to process sustenances. This avoids tooting, ease stomach throbs, e-juice wholesaler and enhances supplement ingestion. Rabbit Tobacco, particularly, is likewise an antispasmodic and diuretic, facilitating intestinal spasms and enhance kidney work. Thank you for that addition. 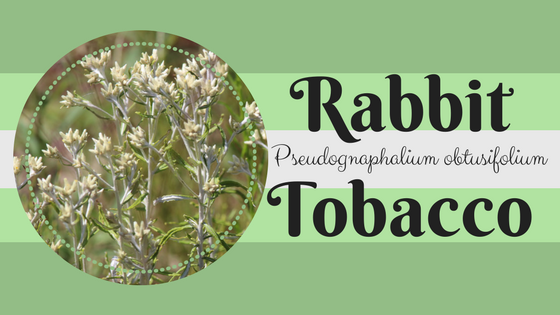 Rabbit Tobacco is a great digestive for many reasons.